Build your own classical or flamenco guitar, using traditional tools, and perfecting the skills and techniques that have enabled luthiers over the centuries to build the finest stringed instruments. What can you do on the course? - We begin with selecting a design (Torres, Hauser, Romanillos, Friederich, Lattice etc.) and choosing suitable tone woods. Then you make the work board ('solera') and other devices needed. 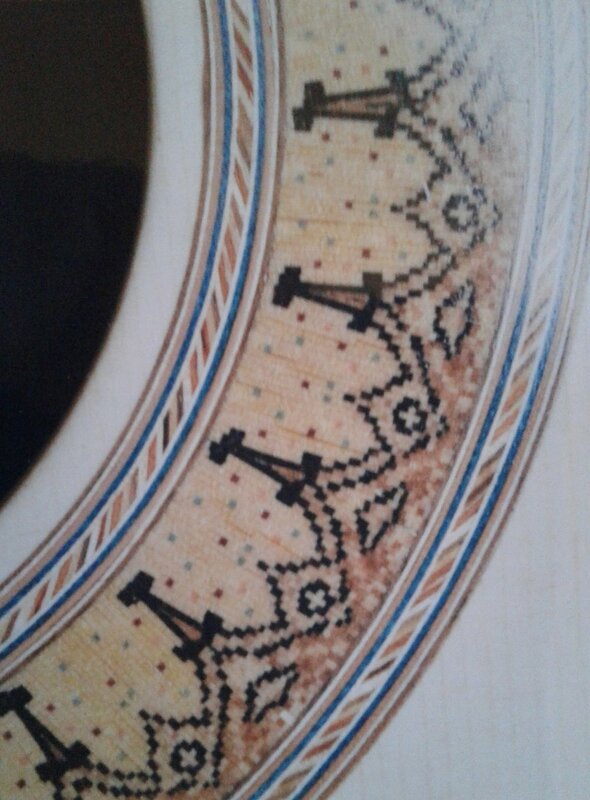 The guitar itself includes making the rosette to inlay around the sound hole; the soundboard must be joined together and the fan strutting prepared and attached. Then the neck, head and Spanish heel / foot are constructed and the machine heads fitted. 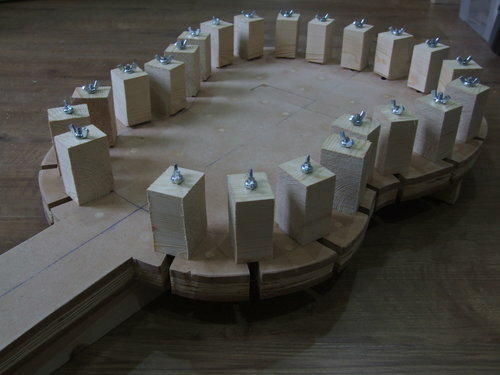 Once the ribs or sides have been planed to thickness and bent to the outline of the guitar body, they are glued onto the sound board with small blocks called 'tentellones'. 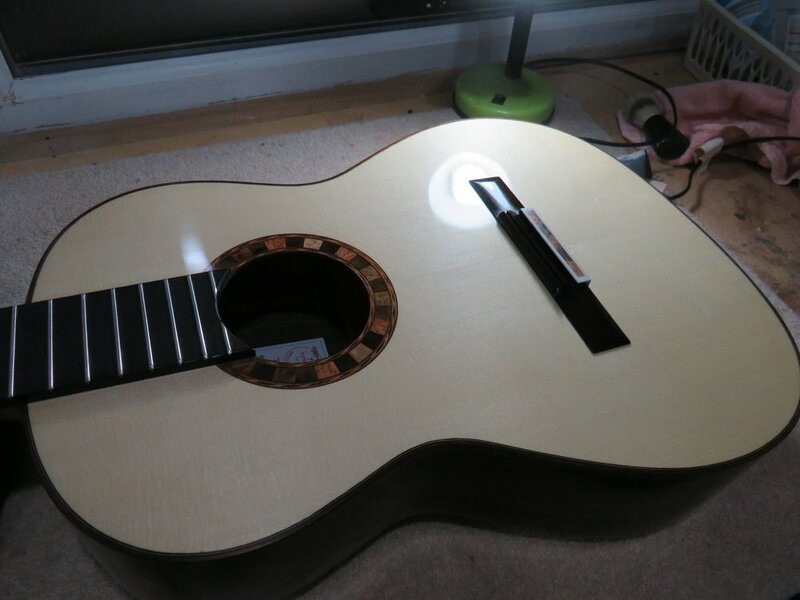 The back is prepared and fixed to the sides, leaving the fingerboard, frets and finally the bridge to be completed. Spanish classical guitars are traditionally finished with French Polish, which is the ideal varnish to enhance the beauty of the wood and does not inhibit the vibration of the soundbox. The course is suitable for complete beginners or those already working on a guitar and who want to come along to focus on specific areas such as making the solera and other essential jigs, rosette making, soundboard construction and strutting, making the neck, bridge, back, fingerboard, fretting, assembly techniques, French polishing and more. I had the good fortune to spend a weekend at Roy’s workshop in Lincoln making a rosette for a classical guitar I am building. While I have made guitars in the past, I had never attempted to make a rosette. It seemed to be a very complex task involving tiny pieces and a lot of patience. I often show people a guitar I have built and the first thing they look at is the rosette and say; “How did you do that”? I explain that I bought it. So I contacted Roy and asked if he could teach me to build one in a weekend. Course fees do not include materials, which can be supplied at cost price or you can bring them yourself. To avoid wasting valuable course-time on basic timber preparation, backs and sides should be obtained ready-sanded to thickness - for this we recommend purchasing from Luthiers Supplies (David Dyke) or Guitartonewoods4luthiers, or other sellers who offer this facility. We can advise you exactly what to buy -please ask. Roy Courtnall began teaching on this one-to-one basis in 1990, helping students from all over the world to get started in guitar making. He was also commissioned by Newark College of Violin Making to set up and supervise a new course in Classical Guitar Making at the college. Over the years Roy brought in other makers to teach with him, including Tony Johnson, James Lister and Adrian Lucas. The course soon became established as a leading teaching facility in the United Kingdom, with many ex-students going to to become successful makers. "Almost fourteen years ago a copy of Roy Courtnall's book 'Making Master Guitars' fell into my hands. This was a very inspiring moment in my life. With this great guide to lutherie I constructed my first guitar and shortly after decided to join Roy's course at the International Guitarmaking School in Newark. With Roy I have learned how to make true classical concert guitars. His tuition and guidance were essential for the successful outcome of my first instruments. Roy's teaching style is calm, authentic and gave me confidence to start my own business as a luthier. I'm grateful to have had the chance to learn with Roy Courtnall and I'm happy to see that he is still teaching young guitar makers today."